Horror movie enthusiasts and loyal fans are invited to join the magic circle and journey into the world filled with ancient dark rituals, spine-chilling suspense and blood-curdling terror when SCREAM FACTORY™ unleashes two of Director Kevin S. Tenney’s creepy supernatural ‘80s cult hits NIGHT OF THE DEMONS Collector’s Edition and WITCHBOARD on home entertainment shelves everywhere February 4, 2014. Featuring a generous dose of gore and violence, NIGHT OF THE DEMONS stars William Gallo (Crash), Hal Havins (Sorority Babes in the Slimeball Bowl-O-Rama), Mimi Kinkade (Night of the Demons II & III), Cathy Podewell (Dallas), scream queen Linnea Quigley (Return of the Living Dead) and Jill Terashita (Sleepaway Camp III). The highly popular ‘80s paranormal thriller WITCHBOARD boasts an all-star cast of Todd Allen (Django Unchained), Tawny Kitaen (Bachelor Party), Stephen Nichols (House), Kathleen Wilhoite (ER), Burke Byrnes (Child’s Play 3) with special appearance by legendary actress Rose Marie. The collector’s edition of NIGHT OF THE DEMONS contains the complete unrated version of the movie for widescreen movie presentation, haunting bonus content and a collectible cover featuring newly rendered retro-style artwork, a reversible cover wrap with original theatrical key art and more! Both horror classics debut for the first time on Blu-ray™. NIGHT OF THE DEMONS Collector’s Edition Blu-ray + DVD combo pack is priced to own at $29.93 SRP. 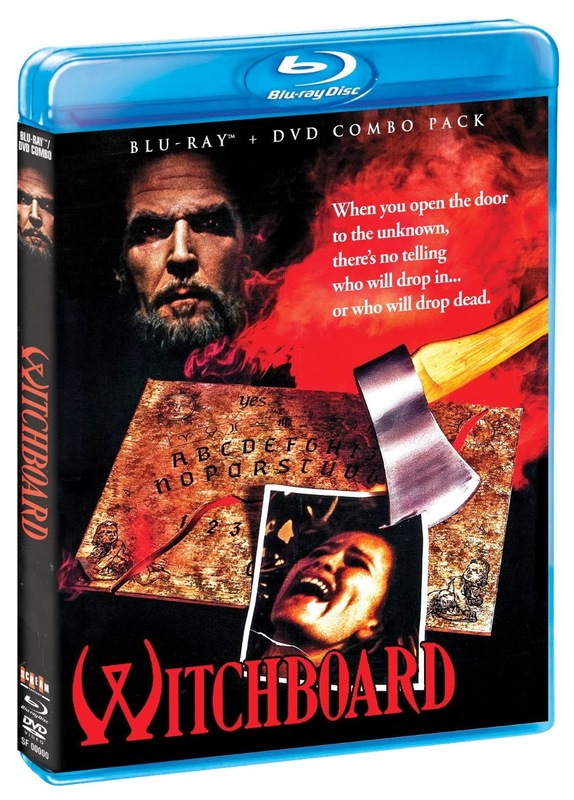 WITCHBOARD 2-Disc Blu-ray + DVD combo pack has a suggested retail price of $26.99. It’s Halloween night and Angela is throwing a party…but this is no ordinary Halloween party. Everybody’s headed to Hull House, a deserted funeral home, formerly the home of a mass murderer. But when the partygoers decide to have a séance, they awaken something evil...and these party crashers have a thirst for blood. Now it’s a battle for who can survive the night in Hull House. · NEW commentary with Director Kevin Tenney and actors Cathy Podewell, Hal Havins, Billy Gallo and FX artist Steve Johnson! It’s called a Ouija Board and it’s been used for thousands of years to communicate with the souls of the afterworld. For beautiful Linda Brewster (Tawny Kitaen), it brings the playful ghost of a dead ten-year-old boy. But when the friendly spirit develops a sudden taste for violent murder and demonic possession, Linda’s boyfriend (Todd Allen) and her former lover (Stephen Nichols) must race to destroy the ferocious portal of the damned. Scream Factory have been KILLING IT with these horror releases! What are your favorites so far? Leave your top picks in the comments!